The head of the Wisconsin Ethics Commission wants the agency to investigate his past conduct. The request from interim administrator Brian Bell comes as Republican lawmakers are calling for his resignation and threatening to reject his confirmation. During a meeting on Friday, Bell read a statement to members asking that they look in to his past conduct at the agency, as well as from his time working at the former Government Accountability Board. “I believe, with all my heart, that an objective review of my conduct in service to this state would definitively show that I have consistently conducted myself in a non-partisan and impartial manner,” Bell said. 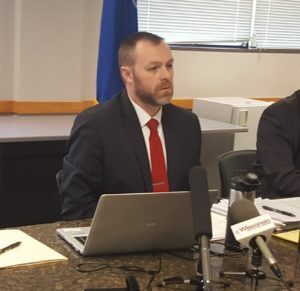 Bell, along with Wisconsin Elections Commission interim administrator Mike Haas, have been asked to resign by Republican lawmakers after the Department of Justice released a report this month that was critical of their response to a leak investigation. The DOJ was trying to determine who gave documents from a secret John Doe probe that targeted Governor Scott Walker’s campaign to The Guardian newspaper. Investigators were unable to determine the source, but said it most likely came from the old GAB – which Republicans split in to two separate commissions last session. Members of the Ethics and Elections Commissions have refuted claims that their administrators have been anything but impartial, and have argued there is no reason for them to resign. While Senate Majority Leader Scott Fitzgerald (R-Juneau) has threatened to reject confirming the two, the Ethics Commission on Friday agreed to ask the senator if he intends to at least hold a confirmation hearing for Bell. If not, members expressed a desire to hold their own informal public hearing on the issue to review Bell’s performance and address some of the allegations. Fitzgerald’s office did not immediately respond to questions about whether a confirmation hearing will be held.